Photo credit unknown at this time. I was afraid of June 30. Afraid that the hate and volatility would erupt. Afraid of chaos and looting. Afraid that Cairo would feel epically dangerous. I was afraid that this fear would be pervasive and women and children would stay home: the numbers of protestors would be low. 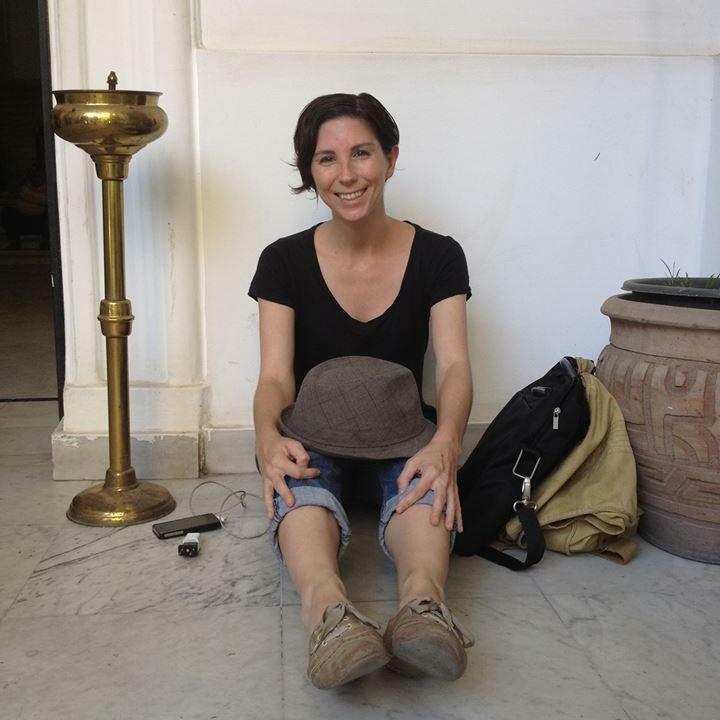 Myself, I didn’t go out alone for the two days prior as I had a new sense of fear I haven’t had before here in Egypt. And I was not alone: after the U.S. put out it’s new travel warning for Egypt, 68,000 people left the country in two days. There were actually boats positioned in the Red Sea to evacuate American citizens if needed. But then I had a dream last week that June 30th would be a celebration, with happy families and balloons and artists. I told my Egyptians pals about my dream and they said I was crazy. As my friends and I joined the march yesterday from the artists’ sit-in at the Ministry of Culture (which a handful of artists stayed behind to protect) through the city for hours and into Tahrir Square, I realized my dream was coming true. The crowd seemed to be 50% women and children. I saw at least five pregnant women. And many, many elderly. There were also marchers in wheelchairs, on crutches, and with special needs. At the front of the march were the artists from the sit-in, including famous actresses, my dance colleagues, and pop singer Ahmed Saad. There were men and women leading chants. And there was a group of large men on Harleys wearing safety vests with a handmade symbol saying ZG (Zamalek Guardians) protecting us marchers. A group of uniformed police officers joined the march along the way and the crowd cheered. 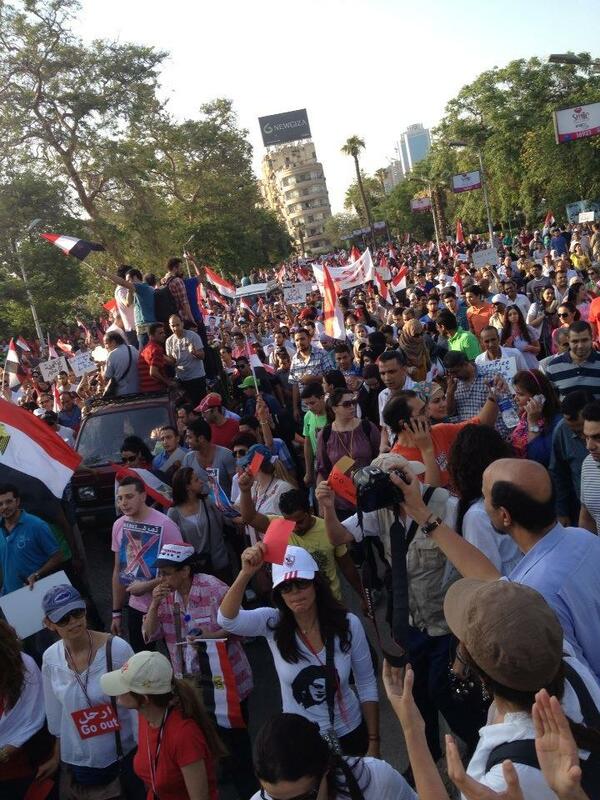 The march from the Ministry of Culture to Tahrir Square. Some people carried posters with an unflattering cartoon of Ambassador Patterson and the Arabic version of the b-word. She recently made some statements supporting Morsi and condemning the protestors before they even started. Find out more about her statements in this CNN article by my new friend Cynthia Schneider we were able to put into motion. Plus, many Egyptians believe the Muslim Brotherhood wouldn’t have so much power without the financial and political support of the U.S. In any case, there was no anti-American harassment in my direction. One older woman refused to take the red card I handed her. She looked suspiciously at me when I said I was American. She asked right away if I supported the Muslim Brotherhood. All I said is that I teach at the High Institute of Ballet. She gave me a smile and a big hug. When we reached Tahrir Square, I first noticed all the neon yellow safety vest of one the “Tahrir Bodyguards.” She was a young Egyptian woman in jeans, calm, with a pride in her eyes as she looked over the joyous crowd. I will never forget her face. Later I saw many more young women as guards, veiled and unveiled. We passed a large group in white t-shirts, men and women, young and old. This was the sexual harassment response unit, and they had no work to do. There were fireworks, corn on the cob, ice cream, flags flying in a brilliant breeze made for flag flying, toddlers bopping to the national anthem… If you blinked you would have thought it was the 4th of July, but massive, and in wartime, in Egypt. There were also kites. People were actually flying kites. Both in Tahrir and at the Presidential Palace. One rumor had it that a woman gave birth in Tahrir Square and named her new daughter Rebel (Tamarod). Even if untrue, it is a great story. And to be honest, sharing this day with my Egyptian friends and witnessing their faces brightening with amazement and pride made me fall in love with them more. One friend just kept saying, “This is incredible!” It reminded me of being in Grant Park the night Obama was elected, but bigger, and instead of celebrating success we were starting something, promising to stand by each other’s side. The pride, peace, and power were immense. The only time we saw a group of people running was when Bassem Youssef showed up. There were rumors that the Muslim Brotherhood were making an attack, but that was a false alarm. In total, it much larger and joyous than the 2011 revolution. 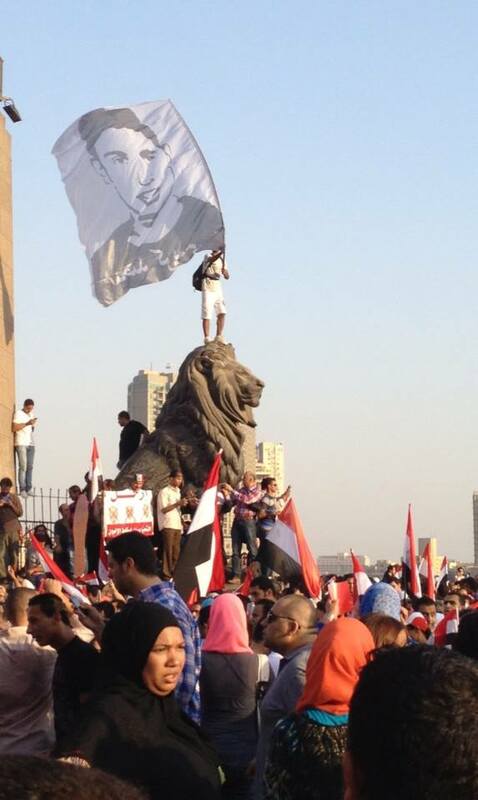 There were demonstrations in many parts of Cairo and in 18 of the 27 governates throughout the country. Protests of support were happening around the world as well, from Chicago to Vienna. 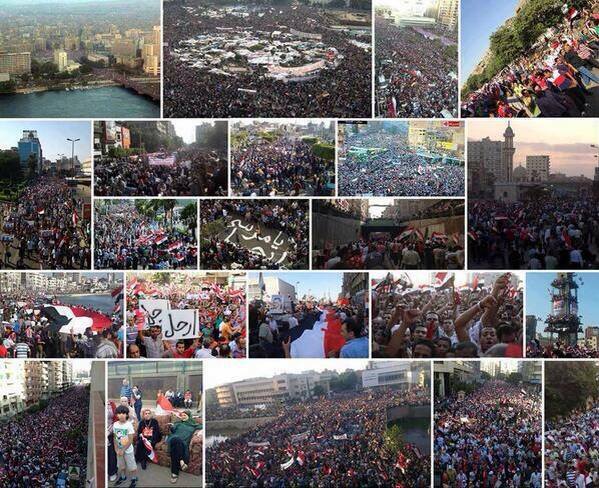 BBC and CNN were both claiming it was the largest political demonstration in human history. Depending on how people count and report, there were between 17 and 30 million people on the streets on the 30th of June, 2013. Why? My opinion: Egypt cannot take much more of this one-party rule which is on the verge of religious fascism. The economy, cultural and arts institutions, diversity, women, NGOs, education, water politics,… They cannot take it. Morsi and his Ikwan brothers may have been “voted in” mostly due to name recognition and circumstances last year, but they are quickly derailing the Jan25 revolutionary democratic train. Doing so much more harm than good that three more years would be unthinkable disaster, nationally and regionally. We must support the artists and activists willing to step up and pull this loving country through the cloud of Islamist colonization. But note that religion is not the divider here. Islam is on both sides. But one side also includes Coptic Christians, Agnostics, secularists, Shia, and embraces diversity. The MB are dangerously xenophobic. That’s what the country is facing down. It is just my opinion, coming from a dear friend of Masr. The title of my Fulbright project was Artists As Catalysts. That certainly was the case here. While the inspiring and intergenerational Tamarod movement (which claimed to have collected 22 million anti-Morsi petitions) inspired the most participation, it was the stories of the ballet dancers on strike and the poets and painters occupying the ministry that made people understand what the Muslim Brotherhood were trying to do to their country. The Bortherhoodization of the Arts, of civil society, of Egypt and the region. Remembering those who died for this freedom. After we got back to the Ministry of Culture last night, there were reports that 7-10 people had died today and there were clashes as protestors stormed the headquarters of the Muslim Brotherhood. While sad news for sure, for a nationwide protest with millions, this was not the violent chaos we had so feared. There were also reports of 46 sexual assaults in Tahrir Square. From the environment I witnessed there yesterday, I cannot fathom how these occurred; and I am outraged. But these reports have brought many, many more volunteers out to make sure it doesn’t ever happen again. I hope with all hope that these assaults stop. The EU and US need to see 3 consecutive days of mass protests before they will back the impeachment of Morsi and the Muslim Brotherhood. The opposition will give Morsi until 5pm Tuesday to resign or there will be wide-spread civil disobedience. People will continue to “occupy” the 3+ major government buildings where sit-ins are now occurring. There is a call for a general strike this week. Protests and marches will continue whenever possible all the way till Ramadan, which begins the second week of July. This may include my idea that I proposed to the Ministry of Culture sit-in organizers, an ART MARCH with musicians, dancers, painters, poets, etc. We’ll see. My boyfriend is trying to manage both artist activism and meeting a deadline for a video project. As for me, I go back to work tomorrow: teaching ballet to children in Maadi, leading dance activities at 57357 Children’s Cancer Hospital, planning a presentation and trip to Greece at the end of the month, needing a haircut, trying to find a job in the world, paying credit card and student loan bills, waiting to see if I passed the FSOT, and attending a meeting for a TEDx Talk I am supposed to be giving here during Ramadan. And if I’m needed to support the Egyptian artists, I will be there. I have never had a wedding or had a child, but I can tell you that June 30, 2013 will always be one of the most beautiful days of my life. Sitting during the Egyptian artists’ sit-in inside the Ministry of Culture. Photo by Sayed Hewedy. This is a moment to be part of…thanks for sharing yesterday’s events. Safe passage in the coming days. wow, it is truly an inspiration reading your blog. i am moving to cairo in 2 weeks, and would love it if you could find room sometime in your schedule to meet up, or perhaps tell me where i could see your students perform. i am an artist, former dancer, and teacher, and have directed family who are nervous about my impending move to read your blog. my email is [email protected]. keep up with the inspirational life!